Russian proxies committed five ceasefire violations in eastern Ukraine yesterday. Moreover, militants resumed attacks on the outskirts of peaceful localities using Minsk-proscribed mortars, reported Ukrainian Ministry of Defense spokesman on ATO Colonel Dmytro Hutsylyak at a press briefing at Ukraine Crisis Media Center. In Luhansk sector, Russian proxies delivered three attacks, all after 21:00. They attacked Ukrainian troops’ positions near Stanytsia Luhanska with small arms and delivered a two-hour shelling on Ukrainian strongholds near Novooleksandrivka using IFV mounted weapons and having fired ten 82-mm mortar rounds. “Russia-backed militants also shelled the outskirts of Krymske, a near-front town, with 120-mm mortars around 21:30. Three explosions were recorded. As per the preliminary information, there are no civilian casualties,” the ATO spokesperson said. In Donetsk sector, Russian proxies committed two ceasefire violations. “In the afternoon militants were attacking Ukrainian troops’ positions on the outskirts of Pavlopil for thirty minutes. Hostile snipers were spotted there as well,” elaborated Colonel Hutsulyak. At about 14:30, Russia-backed militants attacked Ukrainian troops’ positions near Avdiivka with small arms and heavy machine guns. Unfortunately, one Ukrainian serviceman was killed in action near Avdiivka yesterday. 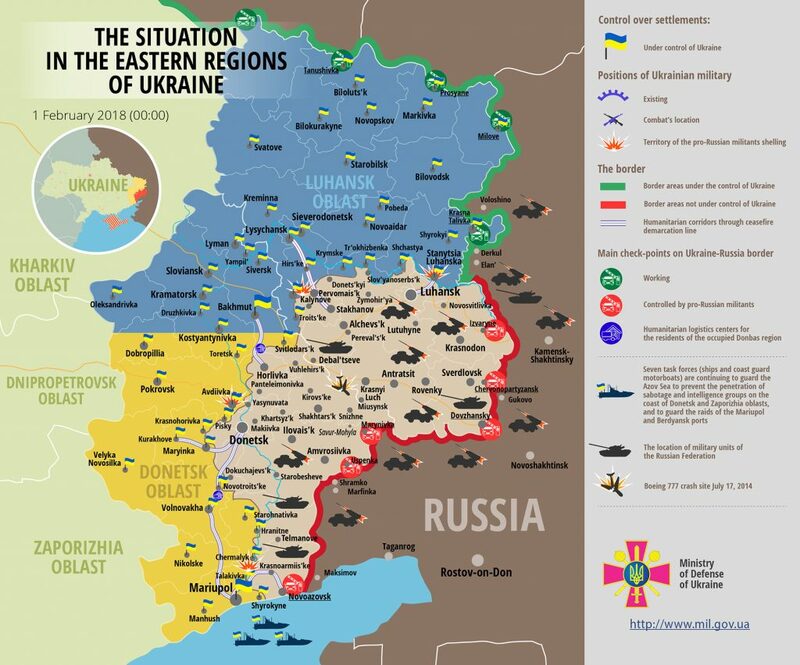 Two more Ukrainian troops were wounded in action as a result of the hostile attack involving 82-mm mortars. Report on the military developments as of January 31 is available here. Interactive data on the shelling: chronology shelling chart and the interactive map.